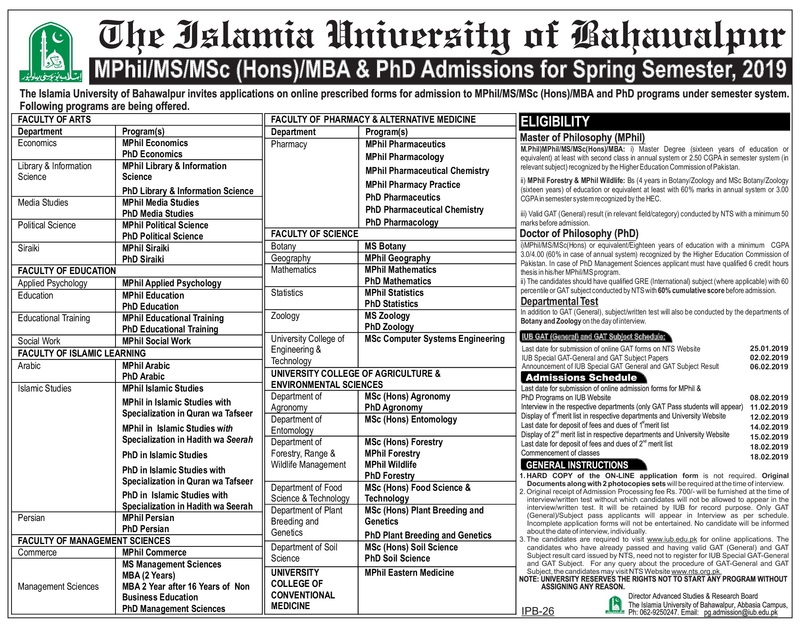 The Islamia University of Bahawalpur invites applications on online prescribed forms for admission to MPhil/MS/MSc (Hons) MBA and PhD programs under semester system. The candidates they want to get admission in such programs they must apply for NTS GAT Subjective and GAT General Test before due date. For this NTS has announced the advertisement of Admission and also application form for admission. The candidates who are eligibile to apply for NTS Gat General registration online is registered themselves before the 25th January 2019. National Testing Service announced the roll number slips for all eligible candidates who are able to appear in the Islamia University of Bahawalpur MPhil/MS/MSc (Hons) MBA and PhD programs under semester system. Once you will apply through the National Testing Service than you must wait for the candidates list for the short listed candidates. In a few days NTS has declared the short listing candidates list who are eligible for written test of Islamia University for admission.In order to appear in any written test conducted by the National Testing Service (NTS), every candidate needs to have a roll no slip. These roll no slips contain the details related to name and roll no. of the candidate as well as the date, time and location of the exam. The slips are usually sent at candidate’s addresses mentioned on the application form via courier at least one week prior to the date of test conduction. The applicant they apply for Islamia University admission NTS GAT General & GAT Subject paper they must start the test preparation. In this page we provide online free test preparation mcqs related NTS Written Test. The applicants must attempts such test and checked your knowledge. We make these test specialy on NTS GAT General and GAT Subject test pattern. The candidates who attempt our test they get good marks in NTS written Test. Master degree at leat with second class in annual system or 2.50CGPA in semester system relevant subject recognized by the Higher Education Commission of Pakistan. BS(4 years in Botany/Zoology and MSC Botany/Zoology sixteen years) of education or equivalent at least with 60% marks in annual system. Valid GAT (General) result conducted by NTS with a minimum 50 marks before admission. MPhil/MS/MSc or equivalent/eighteen year of education with a minimum CGPA 3.0/4.0 recognized by the Higher Education Commission of Pakistan. In case of PhD Management Sciences applicant must have qualified 6 credit hours thesis in his/her MPhil/MS program. The candidates should have qualified GRE with 60% or GAT subject conducted by NTS with 60% cumulative score before admission. In addition to GAT General, Subject written test will also be conducted by the department of Botany and Zoology on the day of Interview.